Found a website that shares great stories? Looking for an app that fetches news from various websites and displays it in a single interface? We’ve shared the list of six great news aggregator apps you can use on your smartphone. The applications fetch news from top websites and display them in a beautiful interface. They allow you to subscribe to updates from websites of your choice. 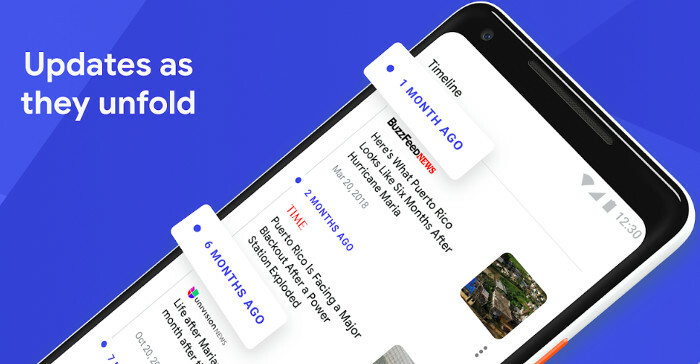 They will display notifications whenever a story is published on the website’s you follow. Time saver: As the apps source news from various websites, users don’t have to find news manually. Fast: Most apps display only the text content and images of the story instead of displaying the entire page of the website. Hence, no matter what your internet speed is, you won’t have wait too long to read the news. 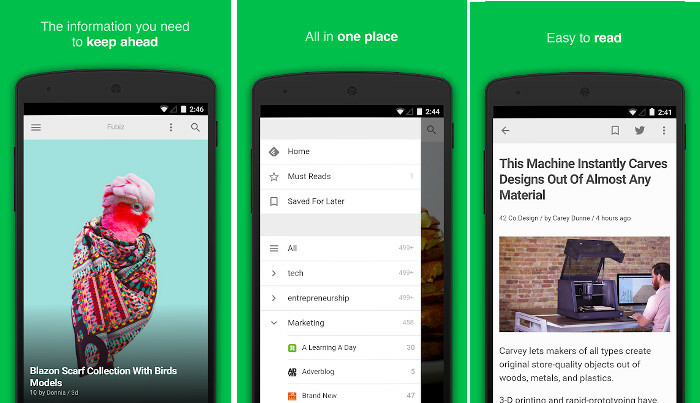 Feedly is a freemium news aggregator app that provides 2 plans to the users – free and Pro. The free version of Feedly lets users subscribe to 100 websites and it has in-app purchases/ads. Feedly has an intuitive interface that displays a story published on a top website. It enables you to find and follow websites. To open the next story, swipe down. To read the previous story, swipe up. Feedly updates the feeds automatically. It hides stores you’ve read. Users of the Feedly application can bookmark stories for later reading. They can change the font family and increase the size of the text. They can also sort stories by their publishing date/popularity and change the theme from light to dark. The app supports card, magazine, article, and list layouts. Pro Search: This feature allows you to find stories containing certain words. The search utility allows you to sort stories by days, date, embedded files, and language. Save To cloud services: Evernote and Pocket are two of the most powerful note-taking apps. You can save your favorite stories to Pocket and Evernote if you’re paid user of Feedly. Integration with third-party services and sharing: Pro users can share stories on LinkedIn. Feedly Pro account supports integration with Buffer, IFTT, HootSuite, and Zapier. Google News is the most popular news aggregator application on our list. It has 1+ billion users. As in Feedly, you can save news in the GN application. The Google application has a slick tabbed interface. The 1st tab displays trending/most popular stories. The 2nd tab enables you to go through the headlines by categories and region. The 3rd tab of GN allows you to follow topics and select your preferred news sources. You’ll also find the list of saved stories in this section. The last tab displays a list of top publications and magazines. You can subscribe to the magazine or read stories published on your favorite sites through this section. GN displays news shared on top websites only. Hence, you won’t come across fake news on GN. Microsoft’s news aggregator app has a tabbed interface. You can configure it to display news published on news websites of 20 countries. As in Google app, you can follow topics of your interest in MN. The Microsoft app can sync your preferences from mobile to PC and vice versa. To enable this feature, you must log in to the app with your outlook account. Unlike Feedly and Google, the Microsoft application doesn’t allow you to save stories. This app supports infinite scrolling and Push Notifications. It lets users change the text font size and activate night mode. The Microsoft application shows related stories below the end of the post. Its APK file’s size is 33 megabytes. Although MN is the largest app on our list, it has the least number of features. 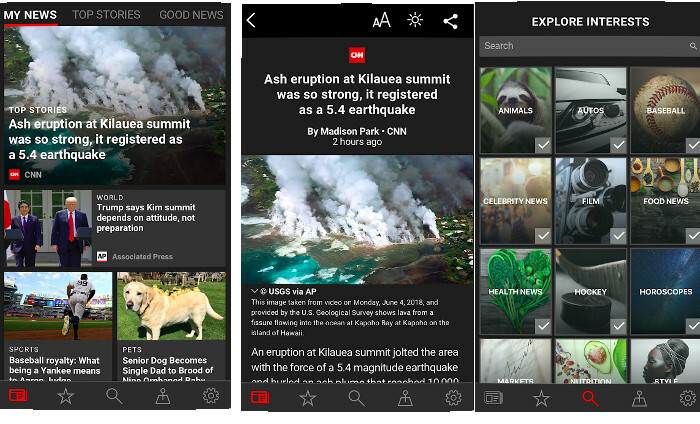 News 360 is the most beautiful and powerful news aggregator application on our list. It is a lightweight application that features beautiful animations and several categories. N360 lets you follow 100s of topics without creating an account or paying a subscription fee. 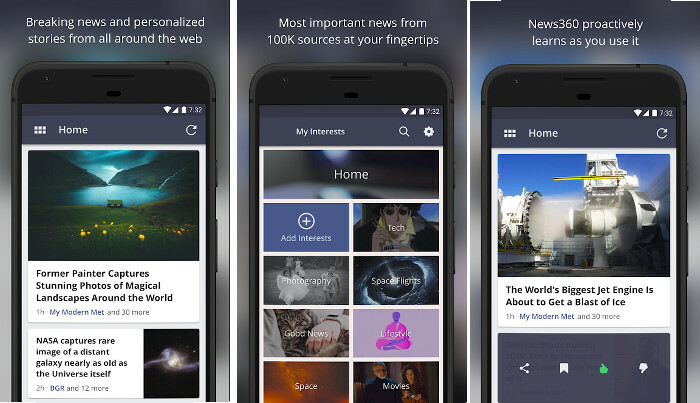 The app enables users to save stories to Google’s cloud storage and note-taking service. You can also share the news with friends on WhatsApp, Facebook Messenger, etc. Users of this app can copy the story to the system clipboard and paste it into a PDF or word document. News360 features a search tool which you can use to find stories containing certain words. It supports three news feed layouts. The Smart News app has a tabbed interface. It is the only app on our list that displays trending stories on Facebook and Twitter. The app allows users to select their country. Once you select a country, it will display the trending and latest news in your city and country. SN enables users to change the order of the tabs. DH has about 50 million users. It is the only app on our list that allows users to comment on posts. You can also reply to comments posted by other users. Users can like stories in Daily Hunt. They can also share stories on WhatsApp. DH provides an option to save stories on the phone’s storage memory i.e. it supports offline reading. 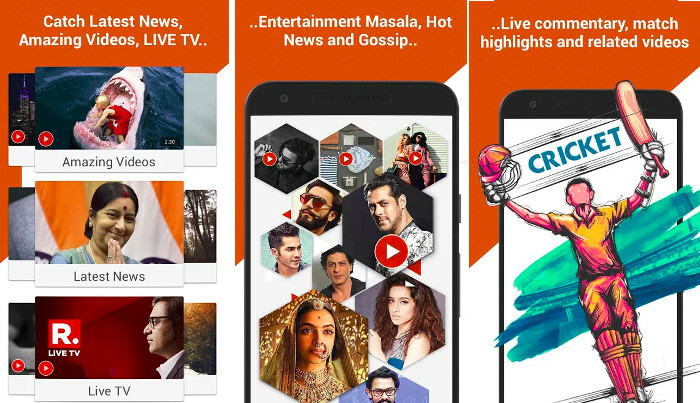 Apart from bringing the latest news on the device, DH entertains users by allowing them to watch trending videos. DailyHunt detects your location and displays local news. It supports 16 languages and two layouts. The first layout will show a large rectangular thumbnail above the post title. The 2nd layout will show a small thumbnail to the right side of the post title. If you love cricket, you can enable DH’s live cricket alerts and keep yourself updated with the latest action on the field. DH displays breaking news stories in the notification panel of the phone. You can change background color of the app’s interface. You can also turn on the night mode in the DailyHunt application. Altough the DailyHunt app offers many features, it consumes a low amount of RAM and storage memory.